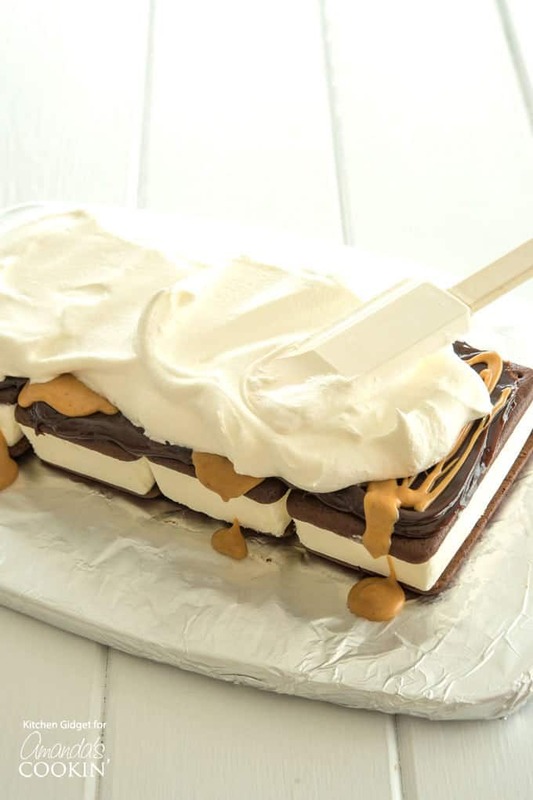 Peanut Butter Ice Cream Sandwich Cake: comes together in 15 minutes! 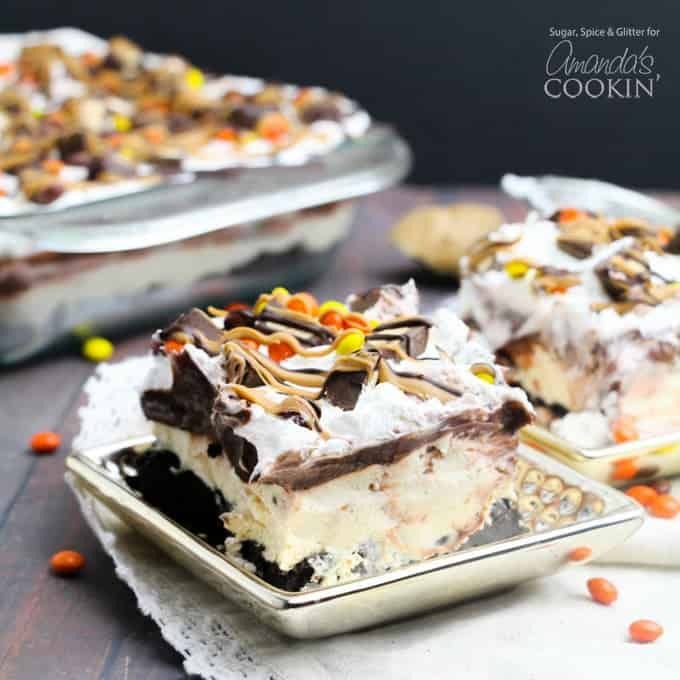 This peanut butter ice cream sandwich cake features layers of hot fudge, peanut butter, whipped topping and peanut butter cups. To top it all off, this easy no-bake dessert comes together in less than 15 minutes! 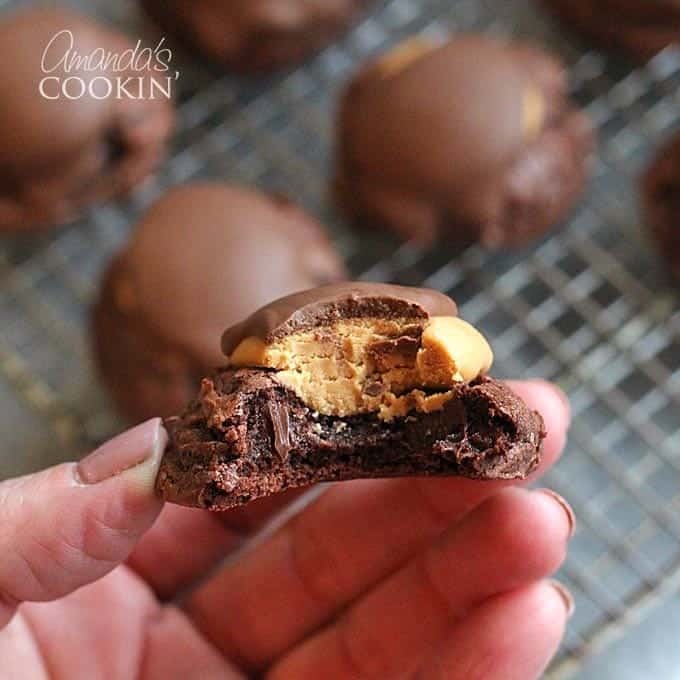 Chocolate-peanut butter lovers rejoice. 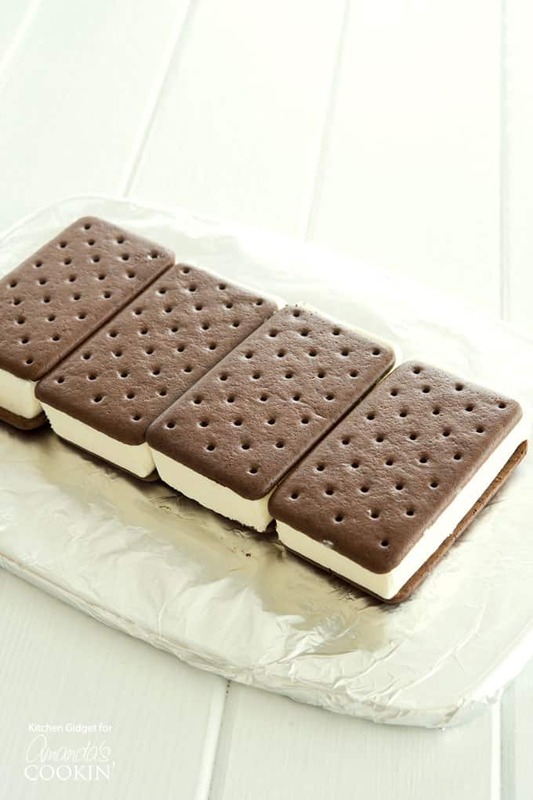 A few weeks ago I was browsing the internet and came across some gourmet ice cream sandwiches. 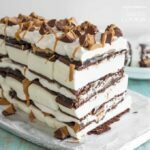 It gave me the idea for this peanut butter ice cream sandwich cake, which I’ve loaded with layers of chocolate fudge, peanut butter, whipped topping and peanut butter cups. I may never be able to eat ice cream sandwiches the traditional way again! There are so many flavor possibilities here and I can’t wait to try one with Oreos based on my favorite Oreo Cake. 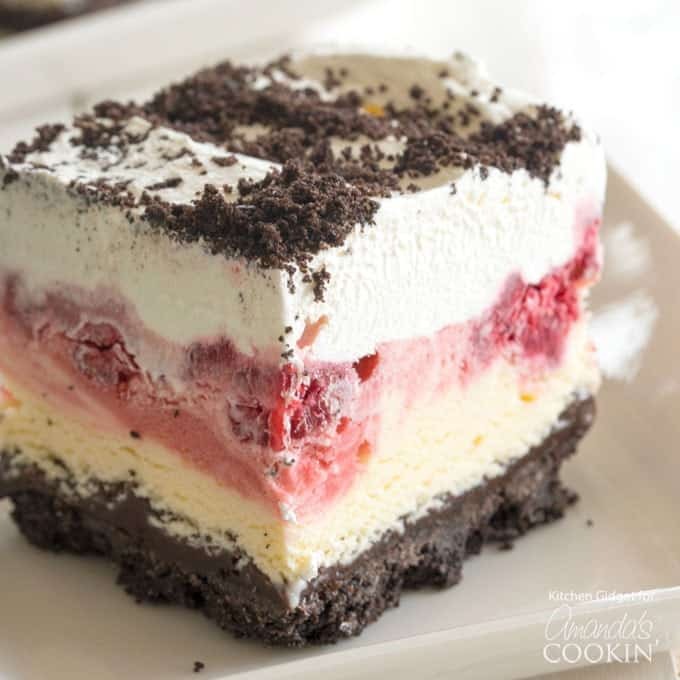 This ice cream cake would make a great cake for a birthday. 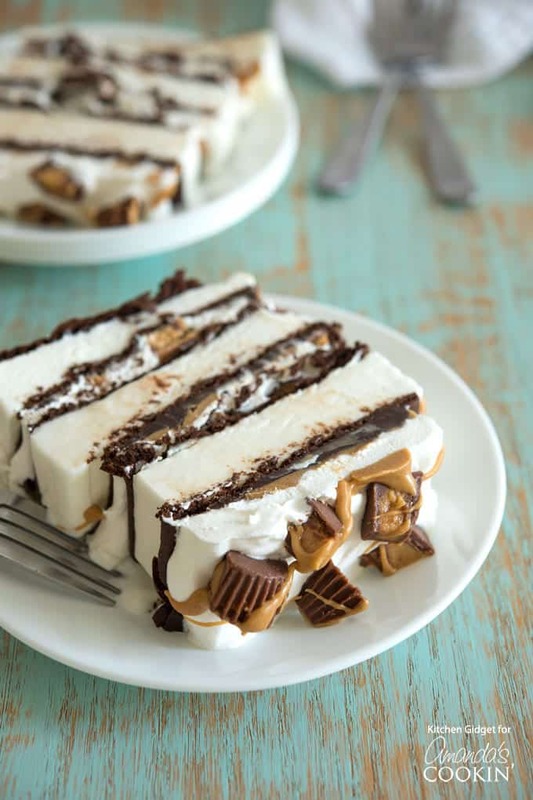 Mine is coming up soon and all I want is this peanut butter ice cream cake and a bowl of queso fresco dip! 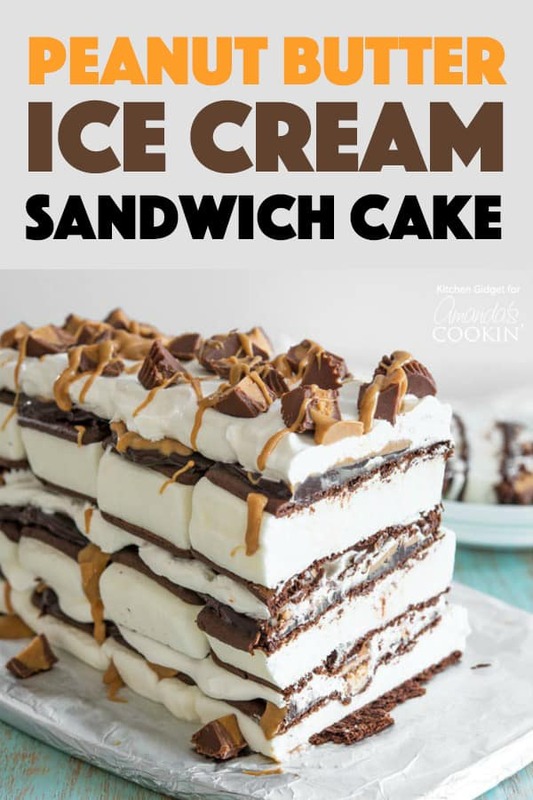 There are two ways to build this peanut butter ice cream sandwich cake, but the same basic principles apply. The first way (which is how I did it), is to assemble the layers free form without any pan. 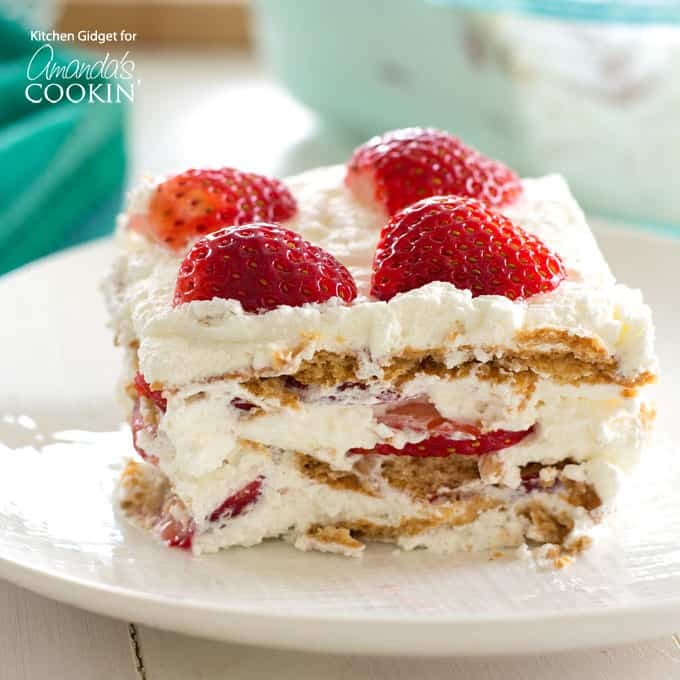 I love the way this one looks – it reminds me of a naked cake and you can build the layers as high as you want. A helpful hint I learned from my chef brother is to cover cardboard with foil as a base for the ice cream sandwich cake. They do this when assembling cakes so they don’t slip and they’re easy to carry from counter to freezer to table. 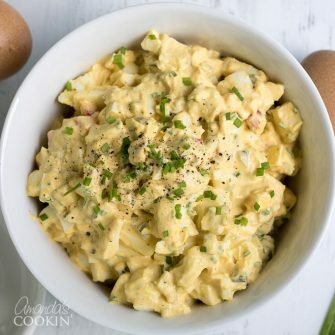 The second way to prepare this is in a pan. The size isn’t so important since you can cut the sandwiches to fit. I definitely recommend this way if you plan on transporting the dessert or space is tight in the freezer. 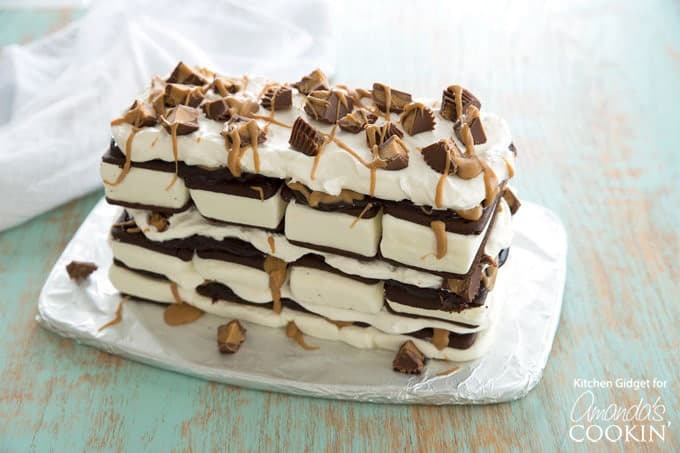 To begin, start with a layer of frozen ice cream sandwiches. I used vanilla, but chocolate ice cream would also be good here. Next, drizzle on a layer of hot fudge sauce, then drizzle melted peanut butter. 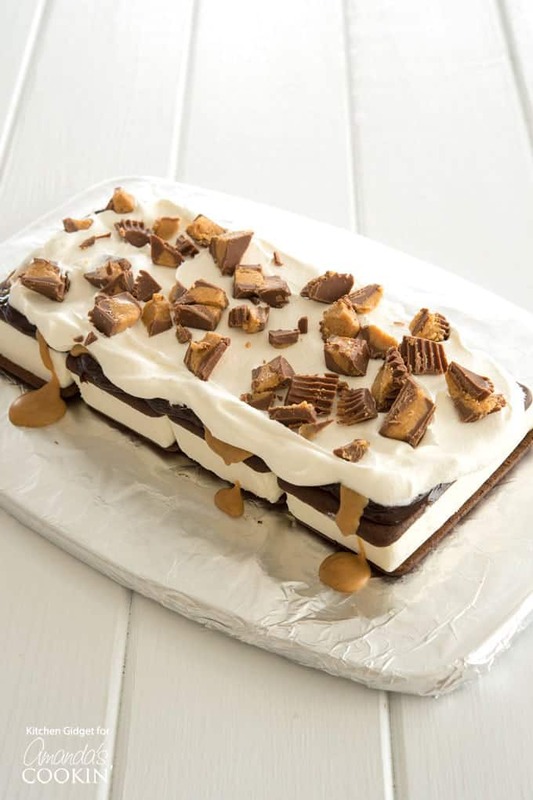 Spread on a layer of whipped topping and sprinkle with chopped peanut butter cups. Repeat these layers 2 more times and then place in the freezer. I recommend waiting until it has frozen before covering. 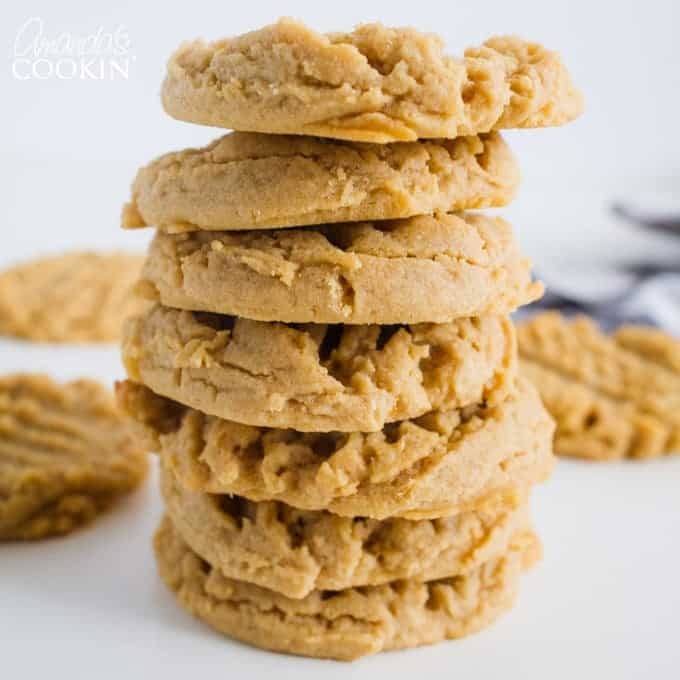 Don’t miss some of our favorite chocolate/peanut butter recipes on the blog below! 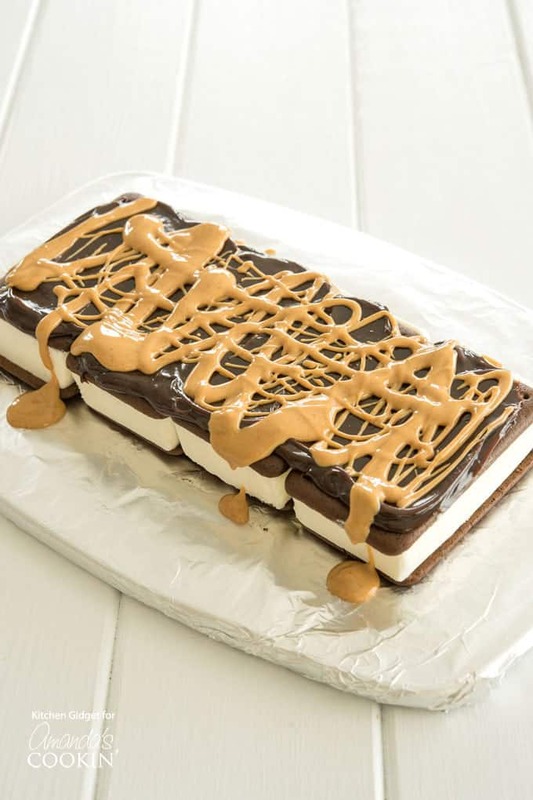 Or more of our icebox cakes similar to this peanut butter ice cream sandwich cake! 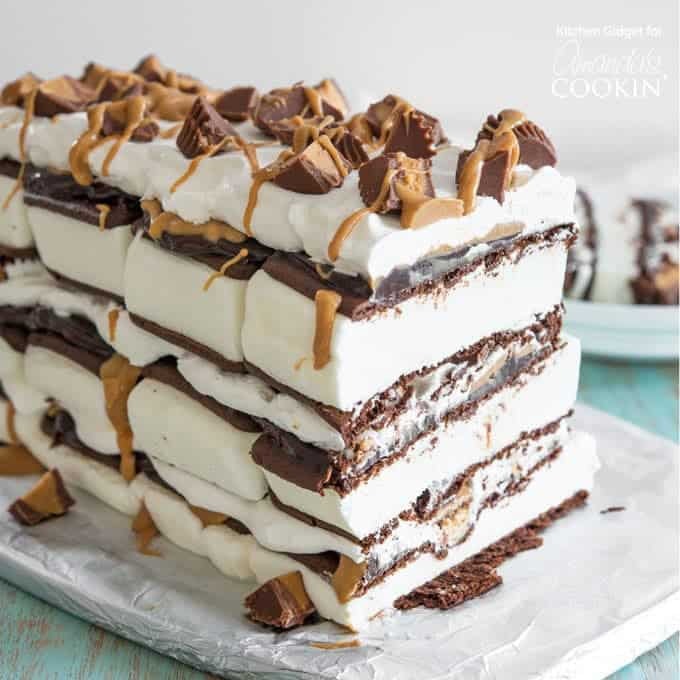 This peanut butter ice cream sandwich cake features layers of hot fudge, peanut butter, whipped topping and peanut butter cups. 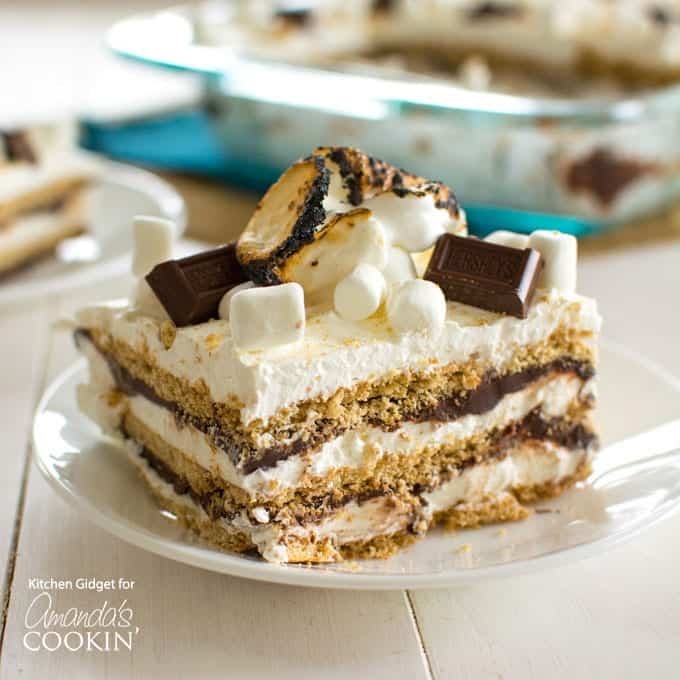 To top it all off, this easy no bake dessert comes together in less than 15 minutes! Layer 4 ice cream sandwiches in a row, long ends touching. Spread with 2 heaping tablespoons hot fudge, then drizzle with 2 heaping tablespoons of peanut butter. Cover with 1/2 cup whipped topping and sprinkle with 1/3 cup peanut butter cups. Repeat layers 2 more times. Freeze until firm, about 4 hours. This cake looks absolutely amazing! Perfect summer dessert!